Only recently three notebooks by Hans von Soden (1881-1945) were found in which he recorded four seminars Adolf Harnack taught between the summer of 1904 and early 1906. The seminars were devoted to the following subjects: Justin's Apologies, Gnosticism, Augustin's Confessions (Books 1 to 6), and the Works of Sulpicius Severus. These records with their detailed accounts provide a precise insight not only into patristic research a hundred years ago, but also into the teaching in a department of the Berlin University at that time. 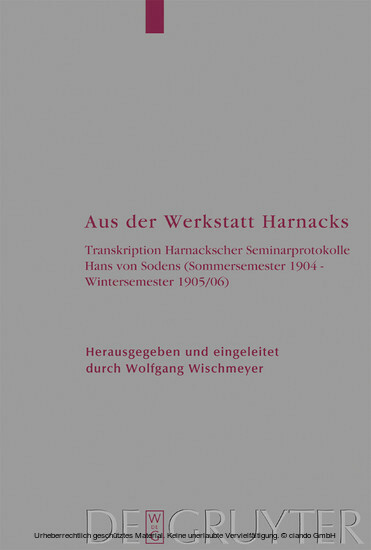 Harnack's scholarly interests in the very varied patristic topics from the 1st to 5th centuries are clearly expressed, as too is his strong theological interest in education, which becomes apparent through his polemics. Wolfgang Wischmeyer ist Ordinarius für Kirchengeschichte, Christliche Archäologie und Kirchliche Kunst an der Evangelisch-Theologischen Fakultät der Universität Wien.